Scott Grannis on Seeking Alpha has written a pair of interesting articles regarding inflation expectations and Quantitative Easing. Grannis thinks that Quantitative Easing is working. I don't, but that debate depends on the definition of "work". The interesting part of the bond market action is in the TIPS market, where yields have plunged by much more than Treasury yields, and in the long end of the Treasury curve, where the spread between 10 and 30-yr Treasuries has widened to its steepest level ever. Since the end of August, when QE2 expectations started to heat up, 10-yr Treasury yields have declined by 10 bps, whereas 10-yr TIPS real yields have dropped by 50 bps. That's a 40 bps increase in annual inflation expectations over the next 10 years. Using the more sensitive measure of inflation expectations—the 5-yr, 5-yr forward breakeven rate—inflation expectations have jumped almost 50 bps since the end of August. The spread between 10- and 30-yr Treasuries has shot up to a record-breaking high of 127 bps, up from 105 bps at the end of August. This is the best evidence you can find that deflation risk has evaporated. The question now is not how low inflation will be, it's how high it will be in the years to come. If the prospects for the economy are improving and inflation expectations are rising, why in the world would the Fed proceed with QE2, when it would only complicate things in the long run? This is really important stuff, and I get the feeling that Bernanke & Co. have not yet thought through all the ramifications of what they are planning, nor have they paid sufficient attention to market-based signals. For starters, deflation risk has not evaporated. Rather deflation expectations as measured by TIPS have fallen, which is a decidedly different thing. Moreover, and more importantly, those deflation expectations pertain to prices, specifically the CPI (which is an extremely poor measure of inflation). As I have pointed out on numerous occasions, prices are not what is at risk. The risk is of a credit collapse, a far different (and far more important thing). In case you missed it, please consider Myths About "What's Economically Important"
Day in and day out I hear it from readers who insist that we are not in deflation and will not be in deflation because prices are rising and continue to rise. Still others tell me it is illogical for a deflationist to like gold. When I counter with a discussion about credit conditions I tend to get a blank stare or a comment like "I do not care about credit conditions. I own my home. What I care about are rising prices of food and energy." When I counter with falling asset prices and zero percent interest rates on savings accounts I am likely to get as statement like "Who cares, I rent? ", or perhaps "The poor have no assets or savings, all they care about is food prices." In a fiat credit-based financial system, when credit is plunging businesses are not hiring. There are currently 14.9 million unemployed who want a job but do not have a job because businesses are not hiring. There are 2.4 million "marginally attached" persons who do not have a job yet want a job, but are not considered unemployed because they stopped looking. There are 8.9 million part-time workers who want a full time job but cannot get one because businesses are not hiring. There are countless millions of college graduates who are underemployed, working at WalMart, delivering pizzas, or attempting to sell trinkets on eBay, because businesses are not hiring. There a still millions more in college hoping for a job upon graduation who will not get one because businesses are not hiring. This is all related to the ongoing credit contraction. When credit is plunging so do yields on treasuries and in turn yields on savings accounts. Those on fixed incomes attempting to live off interest income are screwed. Indeed, many are rapidly draining their principal because they collect no interest. Those who have a job, pay for those who don't. Food stamp usage is soaring and now costs over $60 billion dollars a year. When credit is plunging, consumers are not shopping, business earnings are under pressure, and wages stagnate or in many cases outright decline. Even those with jobs and no debt have been affected by deteriorating credit conditions. Public employees had escaped this debacle so far, but that is about to change in a big way, with huge implications. When business earnings are under pressure or when business owners face uncertainty over consumer spending trends, businesses cut back on benefits, especially health care. Those with health cares benefits are asked to chip in more of the costs. This too is a function of deflation. When profits are weak and business uncertainty high, stock prices do not act well (at least in the long run). Those with 401Ks or personal investments are affected. With credit falling and wages stagnant or falling, anyone in debt is likely to have a harder time paying back that debt. Foreclosures rise so do bankruptcies and divorces. Entire families have gone homeless. So, What's Really More Important? Expanding credit (inflation) created an enormous housing bubble, a commercial real estate boom, a rising stock market, and an enormous number of jobs. Contracting credit (deflation), burst the housing bubble, burst the commercial real estate bubble, burst the stock market bubble, resulting in millions of foreclosures and bankruptcies, millions of broken homes, millions on food stamps, 26.2 million unemployed or partially employed, and countless additional millions who are underemployed. People notice food and energy prices because they tend to be somewhat sticky. Everyone has to eat, heat their homes, and take some form of transportation at times, but is that what's important? In the grand scheme of things, nominal increases in food and energy prices are but a few grains of salt in the world's largest salt-shaker compared to the massive effects of rising or falling credit conditions. If one wants to claim risk of falling prices as measured by the CPI is behind us, I beg to differ, while admitting I can easily be wrong. However, the CPI is fatally flawed in that it ignores housing prices and I am quite sure housing prices are headed for another plunge. General prices (especially 2% CPI inflation expectations) are meaningless compared to housing prices, credit conditions, and defaults. If there was one price Bernanke could force up if he could, it would be housing prices. Does anyone disagree? These inflation expectation measurements ignore not only housing, but also demographics and other investment cycles. As I see it, Long-Wave, Fixed Investment, Inventory, and Demographic Cycles all Downwardly Converging and the implications are anything but inflationary. In light of the above, modest inflation expectations are essentially meaningless. For the sake of completeness of this discussion, however, there is considerable debate as to whether or not it's as simple as subtracting 10-Year TIPS from 10-Year Treasuries to arrive at "inflation expectations". The Federal Reserve Bank of Cleveland reports that its latest estimate of 10-year expected inflation is 1.54 percent. In other words, the public currently expects the inflation rate to be less than 2 percent on average over the next decade. 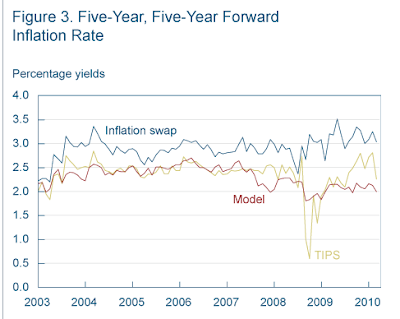 The Cleveland Fed’s estimate of inflation expectations is based on a model that combines information from a number of sources to address the shortcomings of other, commonly used measures, such as the "break-even" rate derived from Treasury inflation protected securities (TIPS) or survey-based estimates. The Cleveland Fed model can produce estimates for many time horizons, and it isolates not only inflation expectations, but several other interesting variables, such as the real interest rate and the inflation risk premium. 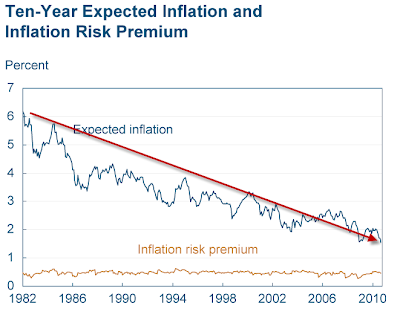 Over a long horizon, one can see inflation expectations have been on a downtrend for 20 years! 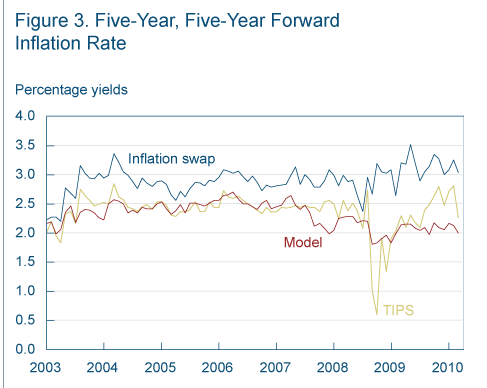 The Cleveland Fed model of inflation expectations provides a simple measure of expected inflation that has two advantages over the break-even rate derived from TIPS. The first is that the measure is adjusted for the inflation risk premium. Because people don’t like the risk associated with inflation, they pay less for a nominal, unprotected bond, which means it has a higher interest rate. 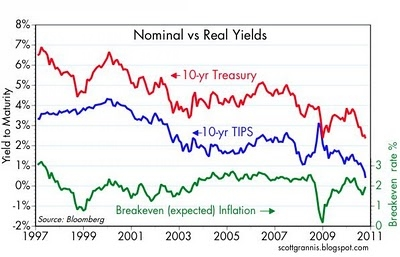 Thus the difference between nominal bonds and TIPS overstates the expected inflation rate. And because the model does not use the difference between TIPS and Treasuries, it does not capture liquidity differences along with inflation expectations. Figure 1 [Mish Note: Same Chart as Above Trendline Chart] shows the model’s estimate of 10-year expected inflation. Expectations show a gradual decline from the early 1980s to about 2003, after which they fluctuate in the neighborhood just north of 2 percent. The financial crisis coincided with very low expectations. 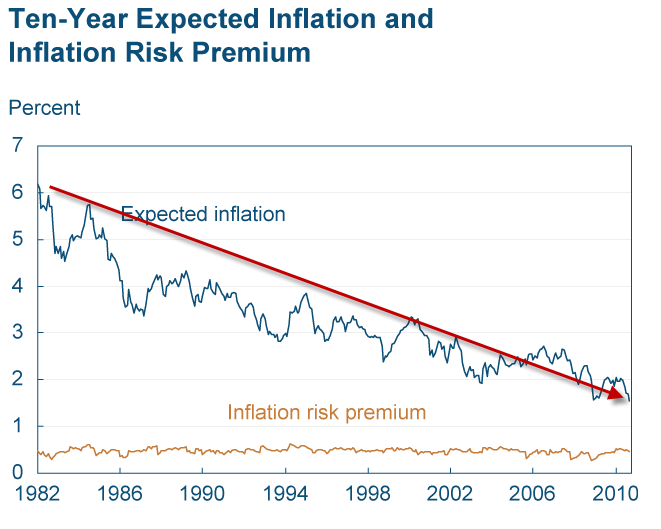 It’s tempting to think that inflation risk is simply the risk of high inflation, but it is rather associated with inflation deviating from expectations, whether higher or lower. Put another way, people anticipate that $10,000 will buy less in 10 years, but they are unsure exactly how much less it will buy. The inflation risk premium fluctuates around half a percent. Even “purified” expectations of inflation are not always the most useful indicators for monetary policy. In the short run, there are price pressures, unemployment effects, and shifts in money demand that move the price level around in ways that are out of the control of the central bank. What’s needed is a longer-term measure of inflation expectations that purges out the short-term effects. The forward inflation rate (figure 3) does that. Figure 3 shows what a difference the approach makes: the Cleveland model shows a lower rate than the other two series over the past several quarters. It stays near 2 percent, while the other measures show a potentially worrying increase. This implies that longer-term inflation expectations are still well anchored and the time for tightening has not yet come. I am certainly not one to give praise to self-serving claptrap from the Fed. Unfortunately, if you read the complete text of those articles you will likely be as nauseated as I was about the glorious praise the Fed heaped upon itself about inflation. However, what the article says about risk premiums makes quite a bit of sense. Yet, even if one assumes the model used by Scott Grannis is correct, those expectations are at the lower end of the range for the last 7-years, discounting panic action in late 2008. Grannis asks "If the prospects for the economy are improving and inflation expectations are rising, why in the world would the Fed proceed with QE2, when it would only complicate things in the long run?" The above question seems to confuse expectations with reality. Does anyone remember the expectation (and all the models built on that expectation) that housing prices would never decline nationally? Yet it happened, didn't it? While I am one to give credence to the bond market (especially over equities), it is important not to make too much ado over short-term fluctuations, especially when the long-term trendline is crystal clear. Nonetheless, I agree with Grannis that the Fed's actions needlessly complicate things for the simple reason the Fed is making its exit strategy worse, while not doing a damn thing to stimulate lending. Returning to the phrase "If the prospects for the economy are improving ..." I suggest the prospects are clearly not improving. Indeed, the odds that the economy is already back in recession have risen from 1% in April to 20% in July (the latest month available). Please see Real Time Probabilities of Recession Above 20% Second Consecutive Month for details. Moreover, in spite of heroic buying of mortgage backed securities by the Fed and mortgage rates at all time lows, housing has fallen into the gutter with new home sales and housing starts also at all time lows. Now, indications are that inventory rebuilding is nearly complete and unemployment is about to tick up. By what measure is any of this improving? Grannis says Quantitative Easing Is Working: A Look at Action in the Markets. The steepness of the long end of the Treasury yield curve reached another all-time high today of 126 bps. 10-year Treasury yields have fallen to their lows for the year, but investors in longer maturities are balking — the steepening of the curve is coming mainly from rising yields on 30-year Treasury bonds, which are up 20 bps since the end of August. That's a sign that the Fed's quantitative easing program is working. A Debate Over the Word "Working"
The steepening spread is not a sign QE is working. It is a sign that investors, hedge funds, and banks are plowing into the central part of the yield curve because that is the part of the yield curve they think the Fed will buy. Bear in mind that I do not think such actions can work against the trend except in the short-term. The implications of that statement are that treasury yields would be falling on their own accord. However, the Fed certainly can goose the market in the direction of the trend, and that it has done. I wish I could quantify exactly how much, but I can't, nor can anyone else. That said, before we can debate whether or not a policy is working, we must define what "work" means. If "work" means steepening the yield curve or getting commodity prices to rise, then one can indeed make a case that QE worked. Grannis also says "The Fed can pin the 10-year Treasury yield at artificially low levels, but easy money can't make an economy grow, except to the extent that the prospect of inflation causes people to invest money they would rather just keep in cash. Shoveling money into the economy mostly results in higher prices, and there is growing evidence that this is occurring." I essentially agree with that paragraph, especially the part "easy money can't make an economy grow." However, this is NOT about inducing rising prices per se (except perhaps housing prices). I do not believe the Fed wants rising commodity prices unless they are accompanied by more bank lending, rising employment, and increased economic activity. If the goals were to jump-start lending, spur the economy, and reduce the unemployment rate, (I am quite certain those were the goals), then QE did not "work", rather it failed miserably. Finally, unless and until the Fed jump-starts lending, inflation expectations can go to the moon but there will not be significant inflation. Please see Are we "Trending Towards Deflation" or in It? for further discussion regarding deflation trends. Because the Fed has not stirred bank lending, the best way of looking at the current environment is that we are in a temporary inflation scare, similar to the inflation scare that we saw when oil touched $140, with talk of inflation expectations not much more than noise, at least for now.